The early 1930's had brought many challenges to the young Christina Shepherd (nee Lee). Relying on the support of her family she endeavoured to provide a home for her three children after the death of her husband Malcolm Shepherd. The 1933 and 1936 NSW Census show her as living in the small coastal of Milton with her sister Mona and her husband Lindsay Shepherd. It was during this time that she caught the eye of a local sportsman, Lionel Carriage. Lionel had been living in the district with his family since he was a small child. He was a talented axeman and had competed in the wood chopping events at all the shows in the district and later competed successfully at the Sydney Royal Easter Show. 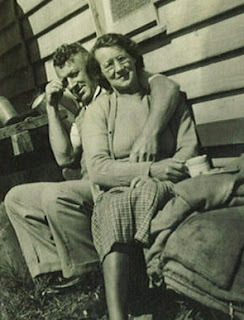 This romance blossomed and on the 3 October 1936, Christina and Lionel were married and the small Methodist Church at the bottom of Wason Street Milton. (NSW BDM 19875/1936). The children were reunited and the family moved into a small wooden cottage at No. 56 Wason Street, Milton. Christina and Lionel lived in this house for the rest of their lives. The children enrolled into the local Milton School and then two years later on the 9 September Lionel and Christina's son Leo was born. Leo outside the Carriage home, 56 Wason Street Milton. Lionel worked in the local Timber industry and was a well known bushman of the district. He continued to compete in wood chopping events and the many Agricultural Shows in the district. Christina also became very involved in the local show society, entering in the many cooking and flower arranging section. Today Christina and Lionel's support and service to the Milton Show Society lives on with memorial awards for flower arranging and wood chopping being awarded every year in their memory. The young family thrived, and though they lived on a modest income, the house in Wason Street was full of lively children and their friends. My father used to delight me with the stories of his childhood. Stories of mischievous pranks and fun growing up in the small country town. In the summer months Christina would send the boys out to collect the blackberries that grew in abundance in the fields around the town, and then she would spend hours cooking blackberry jam and pies. As rationing was introduced during the years of WWII, the Carriage's kept large and productive garden, and Christina was always sharing her produce and eggs with neighbours and family. The War had its toll on most families, nieces and nephews enlisted and the families watched and held their breath as news reached them of the losses of their loved ones. Christina's eldest son Malcolm finished school in the early 1940's and following in his uncle's footsteps he enrolled in the police cadents in Sydney, living with Christina's elder brother Clyde Lee. However, as the threat of Japanese invasion increased he enlisted into the airforce and after training was sent to Darwin. One can only imagine how she felt as her eldest child left home to go off to war. Family life for Christina was about to change again, with her children growing up, leaving home,getting married and the eventual arrival of grandchildren. Christina Part Two - Letters from a troubled time. "We regret to record the death of Malcolm Michael Shepherd which occurred at Nelligen on Wednesday at 7.30 a.m. Sometime back Mr Shepherd met with a severe accident while engaged in his bush work, a tree falling on his head. Since then he has been incapacitated from work, never really getting over the accident. He leaves a wife and three children and was 37 years of age. The funeral took place at Nelligen yesterday." "Teenie, dear I hope you are feeling better by this as I heard nothing of the sad end until Monday, it came a great shock. When I heard no more, I began to think he was better. Never mind my dear, God in his Mercy will look to you and the little ones. Mac was always a good old quiet fellow, and it is to be hoped he is at rest." "Well I hope you are feeling well and the children after your sad loss, I know Teany it is hard to say cheer up for you, I know the feeling you will have for some time but my dear try and look on the bright side as you always did when poor Mack was sick. I think he suffered a lot Teany for what we did not know and God knew best in the end." Faced with the task of caring for three children on her own Christina had to make some hard decisions. 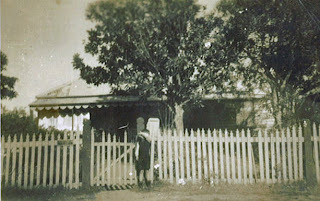 Her eldest son Malcolm (my father) at the age of 6 went to live with Christina's mother Catherine Lee on the family farm at Nelligen, and Christina and the two younger children Colin (4 years old) and Nancy (18 months) moved to the small coastal town of Milton to care for her sister Mona who was not wel1 (1933 NSW Census shows her to be living at Princes Highway, Milton, NSW). One has to wonder how she would have managed in these difficult economic times without the support of her family. Among the collection of letters is one from Christina to her Solicitor in Sydney, in this letter she has written justifying her expenditure of some of the assurance money. "I am sorry I have delayed in answering your letters re administration. I have been away and your letter took a little longer to reach me, and I have been called away on sickness a couple of times, or I would have attended to this sooner. The money from the savings bank I used for extra clothing for the children and myself. There will be 10/- bank expenses and 5'- for cheque book to deduct that leaves 111 pounds and 10 shillings now in the bank. Trusting this will be correct, I am yours faithfully, C.S.Shepherd." 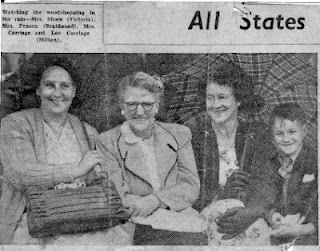 The 1936 NSW Census show that Christina was again living with her sister Mona and her husband on the Princes Highway Milton, helping to care for her ailing sister and her young family as well as her own children. From stories told to me by my father, I know that he was still living on "Acacia Farm", Nelligen with his grandmother while his mother and younger brother and sister lived in Milton. However, 1936 proved to be a year of change for the Christina. A new person came into her life and the family was able to all be together again. What better place to start the stories of the women in my family tree than with my grandmothers. 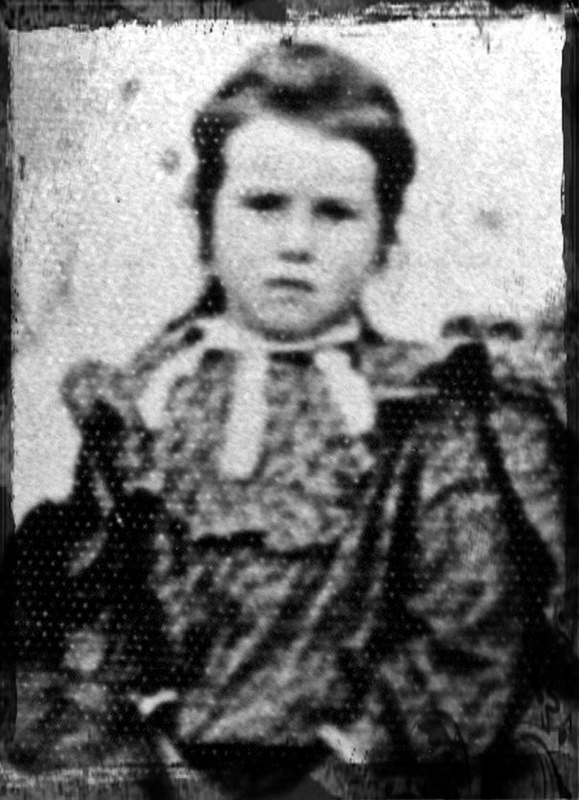 This is a photo of my Nanna, on my fathers side of the family, when she was about five or six. It is taken from a school photo, at Nelligen School. 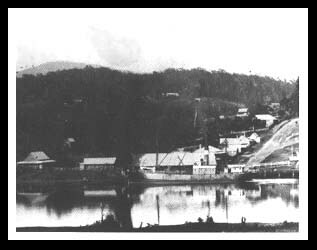 Nelligen is a small settlement on the Clyde River on the South Coast of New South Wales. I have many childhood memories of Christmas time gatherings at my Nanna's house in Milton where all the cousins, aunts and uncles would gather for the annual festivities in Nanna and Pop's old wooden house. The kitchen would be a hive of activity, with Nanna making the traditional Christmas pudding in huge bowl and all the children taking turns to stir the pudding for luck. Christina Sterland Lee was born on 29 May 1901, in the small trading town of Nelligen, on the banks of the Clyde River. She was the daughter of George William Lee (1859-1936) and Catherine McGregor (1866-1945). Christina or Teenie as she was called by her friends was the fourth child and first daughter in a family. She had four brothers and four sisters. At the time of her birth her family lived in 27 Vincent St Nelligen (NSW 1901 Census) . The children were not short of company with their cousins living in two houses next door. (These were the families of her father’s brothers Thomas and Albert Lee). ﻿﻿﻿Her grandfather Thomas George Lee (1832-1936) was born in Clerkenwell, St James, Islington, England and came to Australia in the early 1850’s. He was one of the earlier settlers in the Nelligen District and for many years ran the local store, that was a major supplier of goods to the local district and over the Clyde Mountain to the Braidwood district. While Christina was still at school her family moved to “Acacia Farm” about 8 kms north of Nelligen on the Clyde River. The farmhouse was surrounded by fruit trees and the family grew vegetables and raised cattle. This farmhouse was to see many family gatherings and reunions over the next eighty years. I remember visiting the farm as a small child, when it has been passed on to Christina’s younger brother George Alexander Lee (better known as Jordie). 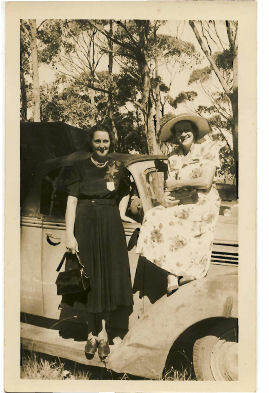 Three of the Lee boys (Clyde, James and Norman) moved to Sydney and joined the police force and her sisters married and lived locally. 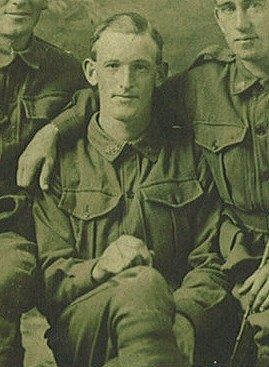 In 1923, at the age of 22 Christina met and married Malcolm Michael Shepherd a returned WWI soldier, whose family had been involved in carrier business between Nelligen and Braidwood since the early 1860’s. Their first child Muriel passed away when she was 11 months old. Three more children, Malcolm, Colin and Nancy followed and the family settled into the district. However, Christina’s happy family life was soon to take a unhappy turn. 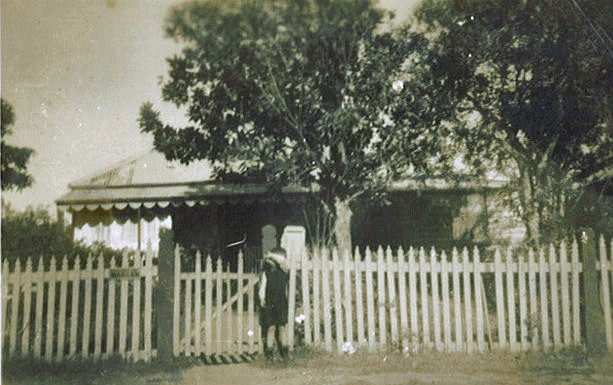 In March 1931 her husband Malcolm was knocked down and seriously injured by a tree. He survived the accident but didn’t fully recover, passing away at the age of 40 in the January of the following year. In the very difficult economic times of the early 1930’s Christina was left with three small children to raise on her own.